Fig. 15.1. Schematic illustration of a resonant cavity consisting of two metal mirrors with reflectivity R1 and R2. The active region has a thickness Lactive and an absorption coefficient alpha. Also shown is the standing optical wave. The cavity length is Lcav is equal to lambda/2. Fig. 15.2. 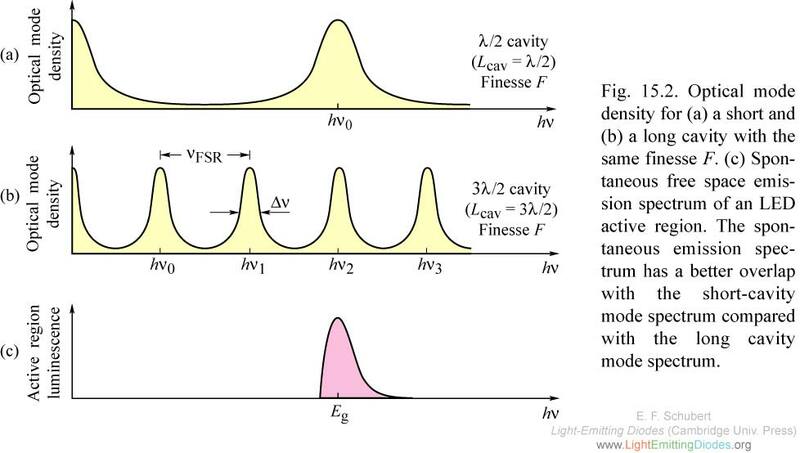 Optical mode density for (a) a short and (b) a long cavity with the same finesse F. (c) Spontaneous free space emission spectrum of an LED active region. The spontaneous emission spectrum has a better overlap with the short-cavity mode spectrum compared with the long cavity mode spectrum. Fig. 15.3. 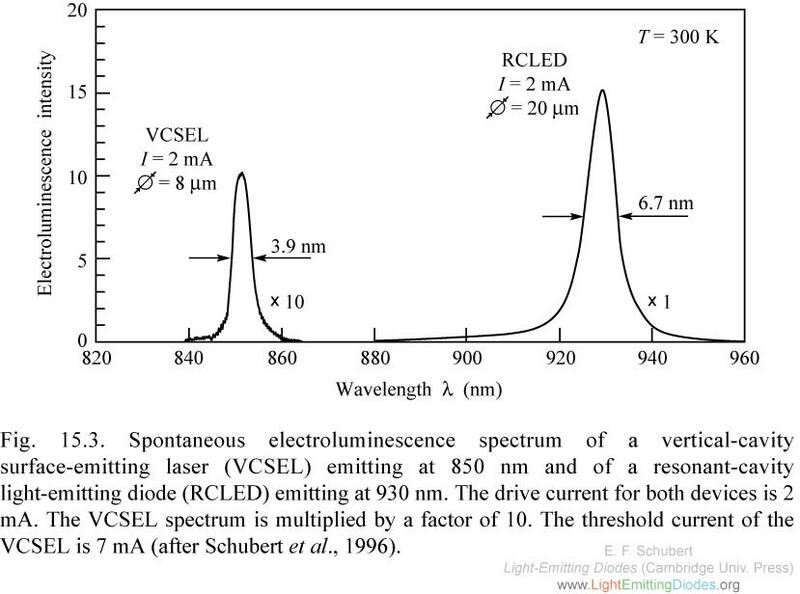 Spontaneous electroluminescence spectrum of a vertical-cavity surface-emitting laser (VCSEL) emitting at 850 nm and of a resonant-cavity light-emitting diode (RCLED) emitting at 930 nm. (after Schubert et al., 1996). Fig. 15.4. 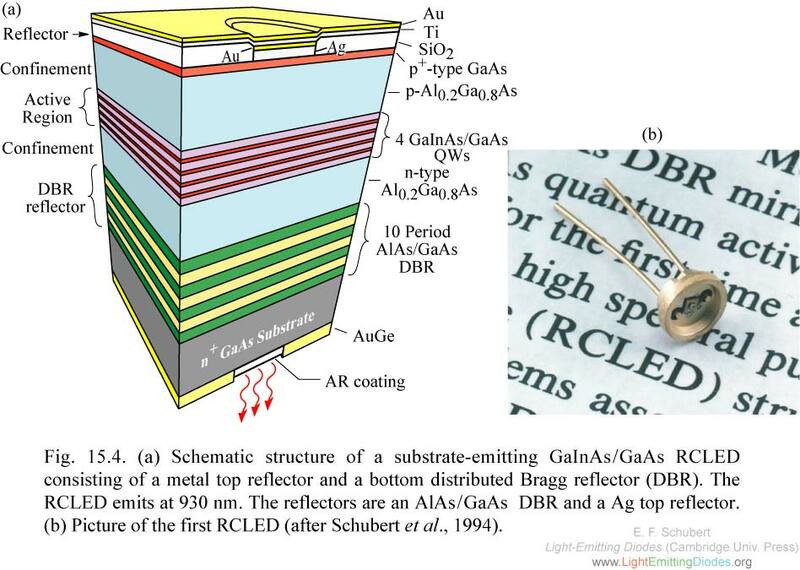 (a) Schematic structure of a substrate-emitting GaInAs/GaAs RCLED consisting of a metal top reflector and a bottom distributed Bragg reflector (DBR). The RCLED emits at 930 nm. The reflectors are an AlAs/GaAs DBR and a Ag top reflector. (b) Picture of the first RCLED (after Schubert et al., 1994). Fig. 15.5. (a) Reflectance of a resonant cavity consisting of a 10-pair AlAs/GaAs distributed Bragg reflector and an Ag reflector. 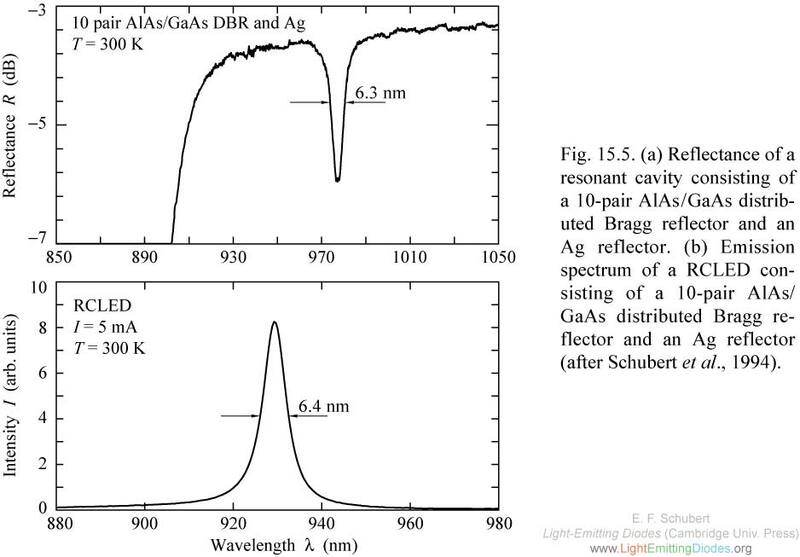 (b) Emission spectrum of a RCLED consisting of a 10-pair AlAs/ GaAs distributed Bragg reflector and an Ag reflector (after Schubert et al., 1994). Fig. 15.6. Comparison of the emission spectra of a GaAs LED emitting at 870 nm (AT&T ODL 50 product) and a GaInAs RCLED emitting at 930 nm (after Hunt et al., 1993). Fig. 15.7. Light-versus-current curves of a GaInAs/ GaAs RCLED and of the ideal isotropic emitter. 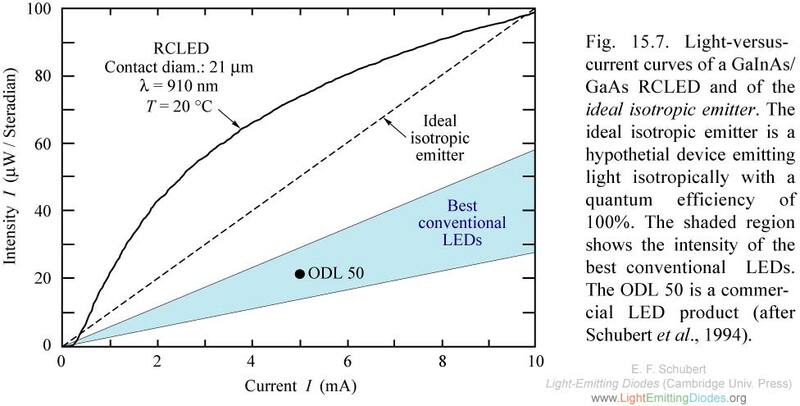 The ideal isotropic emitter is a hypothetial device emitting light isotropically with a quantum efficiency of 100% (after Schubert et al., 1994) Fig. 15.8. 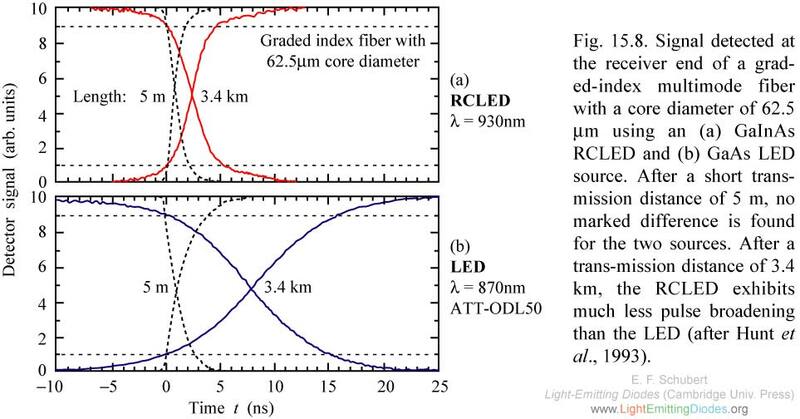 Signal detected at the receiver end of a graded-index multimode fiber with a core diameter of 62.5 mm using an (a) GaInAs RCLED and (b) GaAs LED source. (after Hunt et al., 1993). Fig. 15.9. Structure of a GaInP/AlGaInP/GaAs MQW RCLED emitting at 650 nm used for plastic optical fiber applications (after Whitaker, 1999) Fig. 15.10. (a) Packaged (TO package) RCLED emitting at 650 nm suited for plastic optical fiber applications. (b) Pig-tailed RCLED (courtesy of Mitel Corporation, Sweden, 1999). Fig. 15.11. AlGaInP/GaAs RCLEDs emitting at 650nm. Note the forward-directed emission pattern similar to that of a semiconductor laser (courtesy of Osram Opto Semiconductors Corporation, Germany, 1999). Fig. 15.12. Spectra of light coupled into a plastic optical fiber from an GaInP/AlGaInP MQW RCLED and a conventional GaInP/AlGaInP LED at different drive currents. Note the narrower spectrum and higher coupled power of the RCLED (after Streubel et al., 1998). Fig. 15.13. Two approaches to photon recycling LEDs. (a) Bulk epilayer placed on top of gold. Most spontaneous emission that does not escape into air is reabsorbed and has a chance to emit again. (b) Microcavity designed with a waveguiding active region. Fig. 15.14. Light-power-versus-current curves for single spatial-mode emission from a (i) conventional laser, (ii) a high beta-factor laser, and (iii) a thresholdless laser.